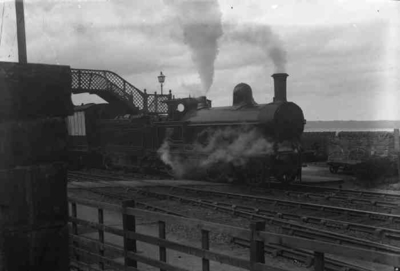 The engine is “Dreadnought” Class No.515 “Niagara” which was scrapped in November 1904. Any information welcome. Can anyone identify the location ? This one looks like Llanfairfechan, looking NW with Anglesey in the distance. The footbridge, trackwork and angled foot-crossing all seem to fit. I have a copy of this photo and the caption agrees with Llanfairfechan and gives the year as 1902.